Denise has always worked on ways to reduce her electricity bill and now she doesn’t have one. 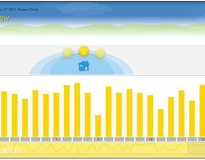 Her SunPower residential solar PV system produces 4,598 kilowatt hours, offsetting 100% of her energy bill. It all started in February 2011, when Denise decided to go solar. With a small roof space yet a lofty goal she choose SunPower signature all-black panels – the most efficient on the market today. While researching Denise learned about the solar incentives that help homeowners in Maryland go solar. And that was a turning point for her. After speaking to several solar integrators, Denise choose Solar Energy World, for its professional service and knowledge in the industry.Denise has discovered some additional and unexpected benefits after installation. The solar panels help protect the roof as well as help insulate the home. And, with skyrocketing energy prices, not having an energy bill is a big plus.The 3.6kW solar PV system is equivalent to preventing 1.1 tons of waste being sent to the landfill.